This is a red band trailer for Blade of the Immortal. It is the 100th film from director Takashi Miike (13 Assassins, Ichi the Killer) and is based on the popular manga series by Hiroaki Samura. 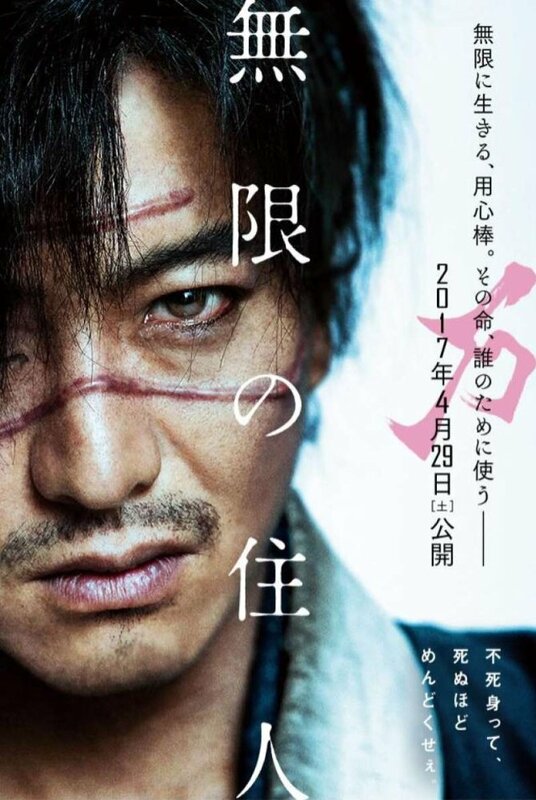 It stars Takuya Kimura (Hero, Howl’s Moving Castle), Hana Sugisaki, Sōta Fukushi, Hayato Ichihara,Erika Toda,Kazuki Kitamura, Chiaki Kuriyama, Shinnosuke Mitsushima, Ichikawa Ebizō XI (13 Assassins), Min Tanaka and Tsutomu Yamazaki. It will premiere in North America at Fantastic Fest in Austin, Texas and then will receive a theatrical release on November 3, 2017. "Manji, a highly skilled samurai, becomes cursed with immortality after a legendary battle. Haunted by the brutal murder of his sister, Manji knows that only fighting evil will regain his soul. He promises to help a young girl named Rin avenge her parents, who were killed by a group of master swordsmen led by ruthless warrior Anotsu. The mission will change Manji in ways he could never imagine - the 100th film by master director Takashi Miike."